Characteristics:Yellow or brown powder;specific weght:1.44;melting:>198. It can dissolve in dioxane, tetrahydro furan and hot acetone, and cannot dissolve in petroleum ether, chloroform, benzene and water. 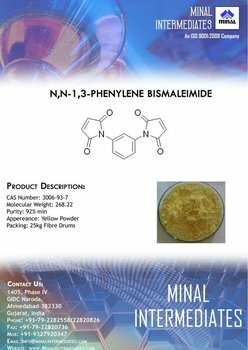 Applications:Curing agent N,N-m-Phenylenedimaleimide, which is named as HVA -2 ( DUPONT)by American company, is a multi-function rubber agent. In the rubber process industry, it can be used as either curing agent, coagent for peroxide curing system or anti-scorcher and adhesion promoter. In additipn to general purpose rubber, it can be applied to plastics, special purpose rubber and rubber-plastic blend. In NR, combining with sulfur, it can prevent compund form reversion during vulcanization and improve heat resistance, heat build-up, aging resistance and adhesive strength between rubber and cord or steel wire as well as moudulus of vulcanizate. The shoiulder-blowing problem of heavy-duty bias tire can be solved by using HVA-2 in tire shoulder buffer stock. It is especially applicable for large size and thick rubber articles, special tire and all kinds of miscellaneous fabricated goods. In special purpose rubber, such as CR, CSM, SBR, NBR, IR, BIIR, acrylate rubber, silicone rubber and rubber-plastic blends, HVA-2 can act as secondary curing agent, giving rubber-plastic blends, HVA-2 can act as secondary curing agent ,giving rubber compounds improved cross-link behavior, heat resistance, compression set, adhesive strength between rubber and cord or steel wire and scorch safety during fabricating. The peroxide amount can be reduced when using HVA-2 and it is applicable to high temperature vulcanizing system. HVA-2 is sulfur free curing agent and be used as a substitute for thiurams, thiazoles and other sulful free curing agent and can be used as a substitute for thiurams, thiazoles and other sulfur containing curing agents in cable compound to solve the problem of copper wire blackening due copper sulfide resulting form the reaction between copper wire and sulfur containing curing agents. Usage: anti-scorcher,0.5-1.0 phr; curing agent 2-3 phr; for impression set, 1.5-2.0; for improving adhesive strength, 0.5-5.0.